You are currently browsing the tag archive for the ‘4-H’ tag. Science, Wildlife Biology, Quilting and Self-Determined to the fair. survived both days thanks to the help of lots of water, for both of them. in one quick week, it’s all over. The week is intense but really a lot of fun. Last week three of my children participated in a fun-filled, energetic theatre production of “The Wizard of Oz” sponsored by Goodhue County 4-H. Missoula Children’s Theatre directors travel throughout the United States and work with schools and local organizations performing children’s stories. 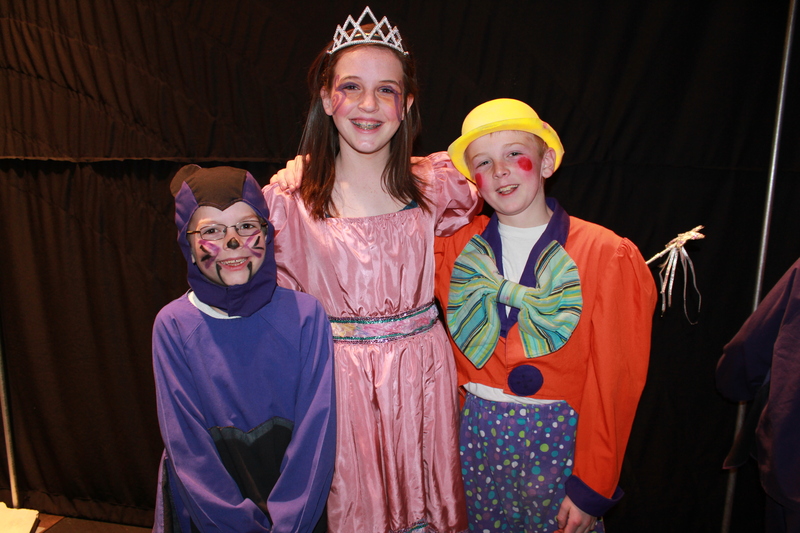 In one week the children audition, learn their given character parts, and perform two shows. It’s a whirlwind week of highs and lows that the kids really look forward to. Monday began with auditions and the news that not every 4-Her who signed up would get a part in the play. This is the first year that there were too many actors and not enough parts. Auditions only last about 1 1/2 hours and culminate with the announcement of which actors will receive which parts. I nervously watched and listened as each of my children’s names were called and they walked up front to receive their parts. Kenny got the part of a flying winkie. Basically equivalent to a flying monkey in the real story. Max would be a munchkin along with many of his 6th grade friends. Finally, Maddie received the part of Glinda, the Good Witch of the North. Maddie is rarely found without a joyful smile, so this part seemed fitting for her. Maddie high-fived the girl who received the part of the Wicked Witch and both were thoroughly thrilled with their given characters. Along with the 4-Hers who were excited about their role in the play, their were also 4-Hers who cried because they did not receive a role or received a part that they deemed less than desirable. This was just the beginning of the emotional roller coaster that Missoula Week becomes. Tuesday, the kids began to get familiar with their characters as the evening practice flew by. On Wednesday, the songs from the play were learned and repeated over and over and over again. My kids sang the songs on the way home from practice that evening and gave me a glimpse of the play. By Thursday, the excitement had worn off and the long hours of practice had started to wear on the kids. Luckily, Friday was a no school day for Goodhue, and the kids got to sleep in. And then Saturday arrived. This was the day the costumes were unveiled and the dress rehearsal was performed. At 2:00pm the kids had their first performance followed by our traditional supper at Liberties. Finally, they had their last performance at 7:00pm. The 4-Hers were exhilarated, and a little sad, as they autographed each others shirts and munched on cookies after the show. It was such a fulfilling week! I wonder what play they will do next year? The kids have been working hard all summer preparing for this week and it’s finally here. The County Fair. The heat and humidity are brutal, but the kids don’t seem to mind a bit. Yesterday, Kendrah, Maddie, and I worked in the 4-H building while exhibits were being brought in and judged. It’s always fun to see all of the different projects created by the 4-Hers. The girls brought projects that they made during the past school year, so there was no “finishing up” pressure on them during the last week. In the evening Brandon and the boys loaded up our show pigs and got them situated in their pens at the fair. Brandon wanted to haul them when it was cool, but there’s no let up in the heat, so evening had to do. Pigs can’t sweat to cool themselves off, so it’s extremely important to keep them cool with a fan or water. Today it was the cattle’s turn to take a trailer ride to the fair. Trying to avoid the hottest part of the day again, Brandon and the kids loaded the cattle up around 7:00am, and got them under fans before it got too hot. The kids also had to get their market animals weighed. It sounds like there was only one pig that escaped into the goat barn, but he was quickly put back with his penmates. After all the chores are done, the kids get to participate in their favorite part of the fair… socializing. On top of all the great things 4-H teaches youth, the kids make great lifelong friends. This evening Kendrah, Maddie, and Max will all take part in beef and hog one-on-one interviews. Being able to communicate effectively is such an important skill. Tomorrow the kids will participate in the beef cattle show and Thursday will be the hog show. By the end of the week we need to get the toothpicks out to keep our kids’ eyes open. What a full and fun week it will be. We are wrapping up our week at the Faribault county fair. For those of you that have been following us, you know we’re pretty involved in 4-H. The kids took project to the fair in areas such as wildlife biology, plant and soil science, robotics, food and nutrition and self-determined. They also took their rabbits and their pigs. Brett and Adam gave presentations on Saturday afternoon. Combine all those activities with working in the Dining Hall, participating in the 4-H Auction and just viewing the fair and you can see it’s been a busy week. The kids have experienced the nervous anticipation of waiting to be judged. They have felt the satisfaction of earning a blue ribbon and the delight of a Grand Champion Purple ribbon. They have also been handed a red ribbon, which hopefully will be a motivation for improvement next year. Brett has earned a state fair trip for his rabbit, wildlife biology project and will be giving his presentation. Adam will take his plant and soil science project to the state fair and will also give a presentation. We’ve had a share of breakdown moments too. Our patience runs thin when we’re tired from moving pigs or cleaning pens or just plain hot and tired. At those times we don’t always use the kindest voice and we have to remind ourselves that we’re all feeling the same way, tired and even a bit stressed. Sometimes I wonder why we do it. Why do we get so involved and push ourselves so much? The obvious answer is for the kids. It’s true, I’ve watched them become better speakers and more confident individuals and I know that’s because of their 4-H experience. But are there other reasons too? It is an opportunity for us to demonstrate some of what we have learned and how we have used our projects to grow and develop as young people. When our days in 4-H are over, we want to take with us what we have gained about honest, ethics, integrity and our desire to be caring and contributing citizens. You’ve taught us how to win; you’ve taught us how to deal with disappointment. But regardless of the color of our ribbons, we hope we demonstrate good sportsmanship today and throughout our lives. Brett, Adam and Beth belong to 4-H and with our county fair only 2 weeks today, many of their activities now revolve around finishing their projects. 4-H not only teaches leadership, community involvement and responsibility, it also teaches you how to work with a deadline. Sometimes that deadline is really tight as the kids finish their projects on entry day of the fair. We call that “working under pressure”. The kids take pigs and rabbits as 4-H projects. 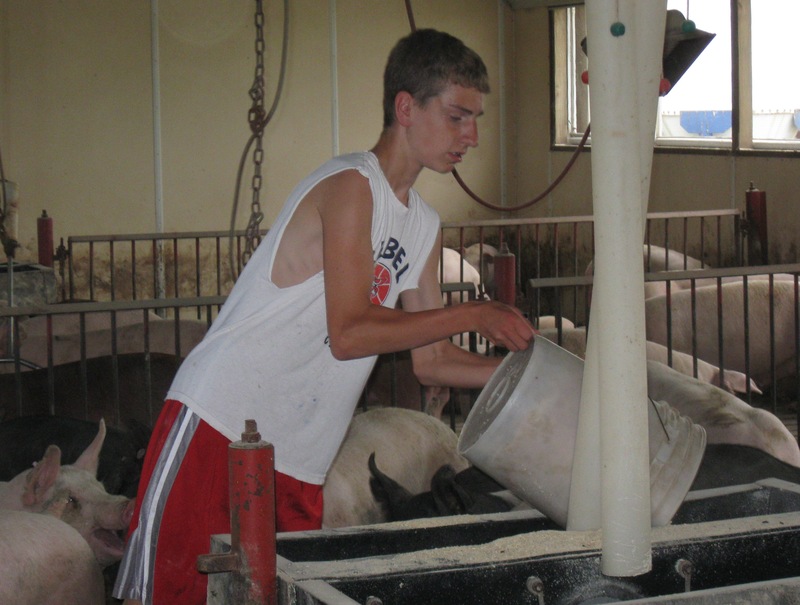 Their 4-H pigs are in the same barn as our regular market hogs, but get fed a special diet, so part of the kid’s job every day is to carry feed to the pigs. That’s what Brett is doing in this picture. This is a good activity for them because they learn to work together as they fill the pails with feed and haul them in a wagon to the barn. They also learn how to care for animals and understand the responsibility of making sure they have feed. They also need to communicate with Dale when the bin is empty, so that he can grind more feed. Interacting with the pigs every day help them monitor the growth of the pig and determine which ones will be best suited for taking to the fair. Generally we’re looking for pigs that represent our targeted market weight, which is 260-280 lbs. We want them to be well muscled and move well. The kids have all taken a Livestock Quality Assurance and Ethics class (LQA&E) which teaches them about animal care and well being and also about proper showing ethics. This is a good class and is required by the packer the kids sell their pigs to at the end of the fair. Being in 4-H not only teaches the kids about the projects, it helps us as parents learn how to “teach” our kids. How “hands on” should we be on a project vs. letting them learn for themselves? Also, when things don’t go right, how do we treat each other? Sharing responsibility and not putting the blame on others are qualities we all need to use, not only for 4-H but for life. These next 2 weeks will be busy. The kids also have projects to complete in plant and soil science, wildlife biology, photography, crafts, robotics, food and nutrition. 4-H is a great experience for our kids and the county fair is certainly one of the highlights of their summer.